Tiger Eye Gem in rectangle shape. 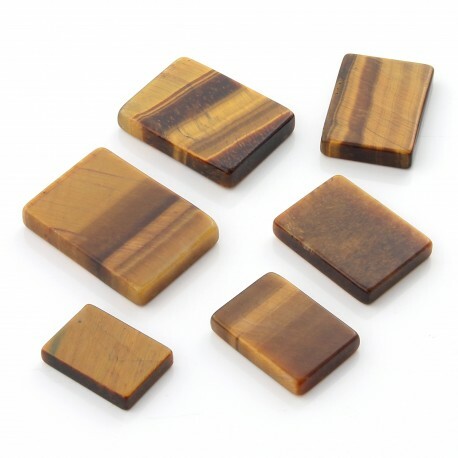 These Tiger eye gems are rectangular in shape and are softened on both sides. These rectangular pieces can be used for macrame and costume jewelery work. Gem of 14.20 x 10 x 2.70 mm approx. and weight of 1 gr. Gem of 16 x 11.80 x 3 mm approx. and weight of about 1.40 gr. Gem of 17.80 x 12.80 x 3 mm approx. and weight of about 1.80 gr. Gem of 18.20 x 13.20 x 3.20 mm approx. and weight of about 2 gr. Gem of 20 x 15 x 3.70 mm approx. and weight of about 2.80 gr. Gem of 22 x 16 x 3.70 mm approx. and weight of about 3.20 gr.